Reading the Ijarah Concept Paper issued by BNM leaves me with one very strong impression; Is BNM seriously asking Islamic Banks in Malaysia to start offering Operating Lease to the customers? In general, Malaysian Banks (as well as many Middle-Eastern Banks) employ the Financial Lease structures for the purpose of financing the purchase of Assets, Equipment or Property. Financial Lease usually refers to a financing arrangement where the Assets are “rented” to the Customer (Lessee) and at the end of the rental period, the Asset ownership is transferred to the Lessee via a Gift transaction, or a nominal amount Sale Transaction. This means Financial Lease is very similar to a Hire Purchase i.e. you hire, then at the end of the tenure, a purchase is executed. The risks and ownership expenses are borne by the Lessee and in the Bank’s books (Lessor), the obligation is recorded as a receivable. But reading the questions posed in the CP, one can’t help but escape the notion that BNM is toying with the idea that eventually, “pure” lease, or Operating Lease will become one of the products that is made available by Islamic Banks. 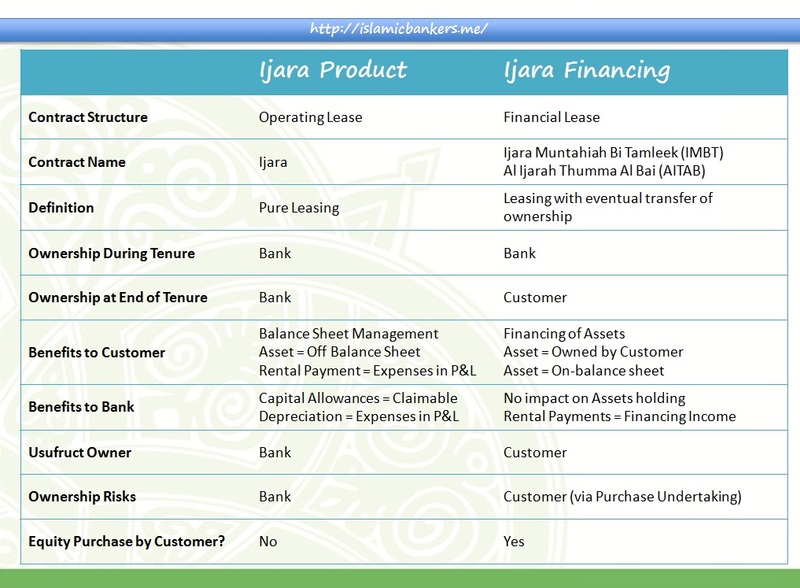 Pure Ijara means that the Bank now takes on the ownership risks associated with the Assets. All ownership-related expenses will now be borne by the Asset owner, namely the Bank. Many Ijara structures nowadays delegates such responsibilities to the Customers by appointing the Customer as an Agent to upkeep the Asset, and it is in the best interest of the Customer to ensure the Asset is in good working condition. Under a pure Ijara structure, ownership will always be with the Bank, and therefore the Bank will incur these cost and shouldering the responsibilities. So what happens under Operating Lease? The Bank will always own the Asset. No transfer of ownership will be made. The Bank must always monitor the market value of its Assets. We might not have the right expertise for this, and may need to outsource this function. Even after the completion of the primary lease period i.e. all payments has been made according to schedule, the Bank must continue to manage and monitor the Assets by extending the leasing arrangement into a secondary lease (which earn very little). To have this monitoring capabilities, full time employees need to be hired to manage the portfolio. The inherent risks for Operating Lease must be seriously looked into by the Bank. The risk of loss of Asset, devaluation of Asset value and maintenance of Assets must be internally catered for. The costs of setting up a unit to manage the Asset may not be cost effective. The way the risks are mitigated. Credit approvals must take into account the various risks offered by the product and take into account the risk appetite of the Shareholders. In short, the Shareholders did not provide funds for the purpose of making in a “high” risk use of their funds. Their mandate is simple; safe, reliable investments and use of Asset. The stamp-duty for an Asset ownership structure is more expensive than the stamp-duty of a financing structure. Why has no Banks seriously exploring and offering pure Ijara? The answer is simple; The high cost of setting up and maintaining the business, coupled with the operational requirements of offering a pure Ijara product, and the risks that the Islamic Bank faces, makes it a difficult product to offer. Operating Lease is not an easy proposition as a lot of infrastructure needs to be built. More importantly, an Islamic Bank is not set-up to take on such high risks on their portfolio. In general, the Banks wants stability in its business model and not take unnecessary risks on its books. Personally, I have seen the operation of the Operating Lease in the first Bank I worked in (actually its a finance company), and it took a lot of effort to build the infrastructure to fully support the Leasing (financing) structure. Ijara Financing provides an easier alternatives but that does not mean Islamic Banks should not start exploring Operational Lease. This might one day meet the lofty aspirations of the BNM; to offer products that meets the international understanding of how an Islamic Banking product should work. At the moment, we are staying off the Operating Lease structures to ensure continued sanity. This entry was posted in Bank Negara Malaysia, Concept Paper, Ijara, Malaysia by Amir Alfatakh. Bookmark the permalink.